How do you choose school desks? What is the best classroom desk? Part one of our school furniture tutorial dealt with classroom seating. In this article we will take a look at classroom desks and tables. So, you have your students sitting on something, but what are they going to write on? Most classrooms of fourth grade and above, but many from first grade on, seat their children at desks (as opposed to sitting them around tables). Most desks these days have a book box; there are generally two types of book boxes: open or closed. An open book box is one that you can see from all sides. It is also sometimes referred to as a wire book box. However, don’t let that fool you. It is not made of thin wire but a solid piece of metal reinforced with several crossbars to hold heavy textbooks and the like. The closed book box is more common. It can be metal or plastic and is characterized by the fact that you can’t see what’s inside the box unless you are sitting at the seat. Some schools insist on the open ones so they can see what their kids have in their book boxes at all times, but most schools do not need this level of transparency. 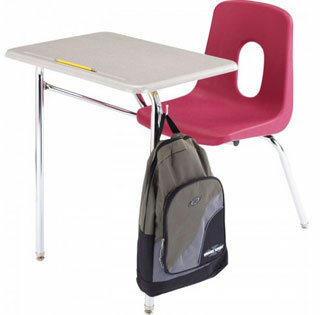 Flip-lid desks are those that have a top that flips up and opens up to the compartment underneath (usually the closed variety). They were popular school furniture in the past, but there were problems (read: lawsuits) of kids having the lid slam on their fingers, so these classroom desks are increasingly rare and generally not recommended. Most classroom desks come with adjustable legs that will enable you to seat kids as small as kindergarten and as old as high school (and adults). The typical desk height for everyone fourth grade and above is 30 inches (that is measured from ground to desk top). For the smaller kids, you want the desk to adjust down to at least 22–24 inches and perhaps smaller for toddlers. Desks, like chairs, come in different colors. The most common colors are the wood colors (e.g., walnut, light oak, medium oak), but gray also is popular. If color coordinating your entire classroom is important to you, consider our Educational Edge series. The Educational Edge desks are just like our regular desks, but feature a gray laminate top with a variety of trim colors, including red, blue, green and others, which you can view on our website. This adds color to your room — and can be coordinated to match the color of your Educational Edge chairs, bookcases, and teacher desk. The last, but probably the most important, consideration in choosing school desks is the type of top. The least expensive top is called a laminate. This is essentially a wood top with a processed surface protecting it from minor damage. These are fine if you don’t think your kids will try to write on the desk itself and/or dig pens and/or sharp edges into it. If you are concerned about that — and, let’s face it, most schools are — you will want to consider a hard plastic desk top. As it sounds, this is a solid piece of hard plastic. A kid can try to dig his or her pen into it, and nothing will happen. Hard plastic is extremely durable and a smart choice that could save you money over the life of the desk even if they cost more initially. There is, however, a third choice that combines the strength of hard plastic yet approaches the price point of a laminate (wood) surface. This is Hertz’ exclusive WoodStone series top. WoodStone is a hard plastic surface (it’s not wood and it’s not stone) with a core of wood and/or wood parts. The surface is hard enough to resist essentially everything a regular hard plastic top will resist, but is less expensive to make and saves you money. The Educational Edge School Desk has a WoodStone top. If you are furnishing a completely new classroom without any furniture, or are thinking of replacing old school furniture with the new, this information should help you in your research. However, if you have further questions or you'd like assistance in finding classroom desks that will best suit your needs, feel free to contact a Hertz Furniture expert at 888-793-4999, or by chat between 9am-5pm EST. Also, see Classroom Furniture: Classroom Seating.